This has been the year of homemade Christmas gifts. Most of them because I couldn’t find anything in the store that seemed just right. The tablet case pictured above is all dollar store materials (tablet not included). My son really enjoys minecraft and I just couldn’t find any cases that both fit his interests and would protect his upcoming Christmas present. 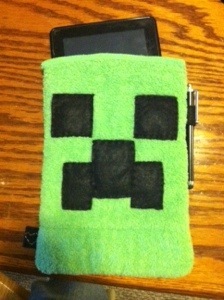 This case took about 60 minutes and $3.00, and that does include the stylus. It is sewn completely by hand and should protect the tablet from drops and moisture. Odds are you already have some of these things on hand, but if you don’t at worst this project will cost you $5.00. Cut out your pieces of black felt and sew them to one of the dusting rags. Sew your velcro to the inside of the two panels. Make sure the pieces line up so you get a nice secure grip when it is closed. Make a small felt loop to hold the stylus and use a stitch or two to hold it to the case wherever you want it to rest at. Flip the entire project inside out so the face and stylus loop are on the inside and the velcro is on the outside. Sew the three sides that do not have velcro. Flip it back right side out and enjoy.